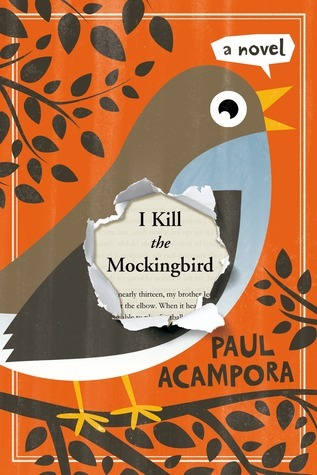 When Lucy, Elena, and Michael receive their summer reading list, they are excited to see To Kill A Mockingbird included. But not everyone in their class shares the same enthusiasm. So they hatch a plot to get the entire town talking about the well-known Harper Lee classic. They plan controversial ways to get people to read the book, including re-shelving copies of the book in bookstores so that people think they are missing and starting a website committed to “destroying the mockingbird.” Their efforts are successful when all of the hullabaloo starts to direct more people to the book. But soon, their exploits start to spin out of control and they unwittingly start a mini revolution in the name of books. Whenever I saw this book in the publisher's catalog, I knew I had to read it. To Kill A Mockingbird was one of my favorite books as a kid, one that I would read every year or so on my own, not even because school made me. One of the most amazing things about that book -- and many classics, really -- is how my understanding of it changed and grew as I got older, and how different aspects resonated with me as a kid versus as an adult. Lucy, Elena, and Michael are probably around the same age I was when I first read the book, maybe a little older, and I appreciated their enthusiasm for literature. Sometimes they felt like they were written to sound a little older than they really are, but perhaps they're all just extra-precocious. They certainly were more well-read than I was at that age, and I was a pretty big book-worm. There are hints of a romance in here, but it's nothing big, never takes over the story. It's just two kids navigating a first crush and everything that comes with that -- nothing that should turn off readers who aren't looking for a love story or anything. I definitely recommend this book, and think it would appeal to teen and adult readers -- really, anyone who's ever been a bit of a bookworm -- despite the young age of the characters. The writing is simple, but sharp and witty, and it's a very quick read, to boot. I HAVE this book, but for some reason I never got to it this month. (Wasted too much time on a book I didn't enjoy. *sigh*) Glad to hear that you liked it, and I hope to get around to it soon!